After all the feasting and festivity of the holidays is over, it is time to focus on determining how you will keep to the resolutions you enthusiastically made. If adopting better eating habits is on your list of goals for 2018, now is the perfect time to make changes. After allowing yourself to overindulge during the holidays with family and friends, set realistic and achievable goals now to start the year on a positive note. With a variety of nutritious food options available, committing to a healthier lifestyle does not have to be a challenge. You can also contribute ideas for your office party catering. Healthy crepes may be a welcome choice over pizza and wings! Spread the word so that 2018 sees more people eating healthy at work and at home. Sustaining healthy eating habits through the year can be achieved by planning ahead and following a few simple guidelines. Empty the Fridge: After the holidays, chances are your fridge is stocked full of indulgent dishes and decadent desserts. Avoid the temptation and give your leftover holiday treats to family, friends, or coworkers. At the start of the year, begin by reorganizing your fridge and pantry. Encourage good habits, such as drinking more water instead of sugary drinks, and cook meals for the family at home. Eat a Healthy Breakfast: If you begin your day by eating an unhealthy breakfast, you are more likely to continue your unhealthy eating pattern throughout the day. Each day should start with a nutrient rich breakfast including fruits and vegetables to provide you with vitamins and minerals. Additionally, eating a healthy breakfast can help curb cravings later on in the day. Prep Your Meals: While exercising is important, the key to a healthier lifestyle can be found in your fridge. Preparing your meals in advance will give you more control over what you put into your body, as well as save you valuable time during the busy work week. Include items such as lean proteins that will help keep you feeling full for longer. Portion Control: Instead of sitting down to eat larger meals, consuming smaller meals throughout the day will ultimately provide more benefits. Keep in mind; it takes approximately 20 minutes to feel full after eating a meal. Therefore, it is important not to overeat. By eating to 80% fullness during your meal, you are less likely to consume more food than necessary. Furthermore, pay attention to the types of snacks you have throughout the day. Swap junk food for fresh fruits and vegetables, and nuts instead. Manage Your Stress: The food choices you make are heavily influenced by environmental factors. Find ways to manage your stress so you can avoid relying on food for comfort. For instance, reading a book, going for a walk, or meeting friends are all healthy ways to cope with stressful situations and they will take your mind away from reaching for unhealthy foods. Now that the holidays are over, it’s time to get back into shape. There is no better way to start off the New Year than by eating right to keep your mind and body strong. At Crepe Delicious, we have some unique crepe ideas for you. Our crepes are created with only the freshest ingredients and made to order just for you and any special occasion. Try our Tuna Tango Crepe, made with our homemade tuna salad, fresh toppings, and melted mozzarella cheese. In addition to protein, eat more colourful vegetables. 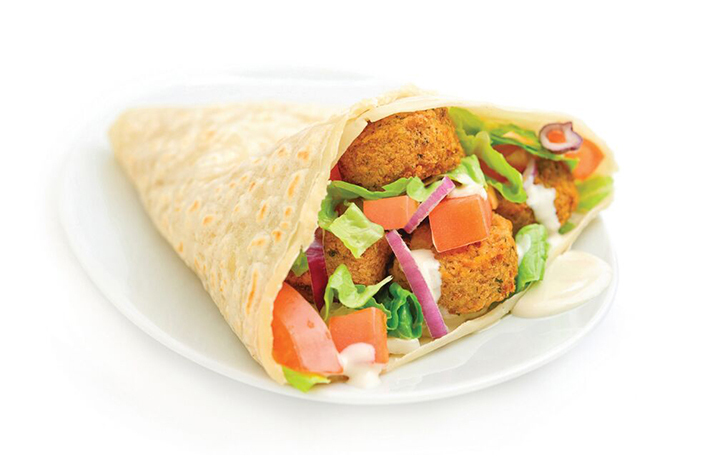 Our Falaffel Licious Crepe is made with hummus, lettuce, tomato, red onions, falafel, and Greek sauce. This signature crepe is sure to satisfy both vegetarians and meat eaters. We are proud to offer a full catering service for your all parties and corporate events. Select from our menu or ask us about creating customized crepes that both you and your guests will love. At Crepe Delicious, you can find a variety of healthy crepes on our menu. Stay true to your New Year’s Resolution and visit a location near you.